CAMPBELL RIVER – Cleanup crews remain on the scene of an overturned semi that was hauling groceries along Highway 19 early Friday morning. 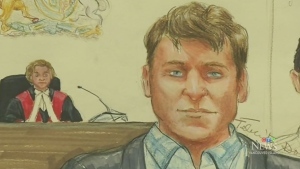 The truck was travelling northbound along the Inland Island Highway, transporting groceries from Surrey, heading towards the Canadian Superstore in Campbell River. No other vehicles were involved. 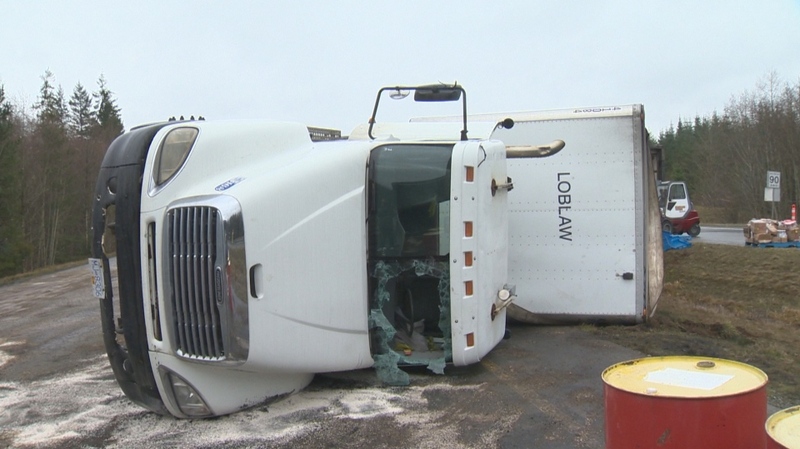 Main Road North Island Contracting Supervisor Damian Girard says his crews were notified of the crash around 2:15 a.m.
“It sounds like the driver may have been distracted or fell asleep and he went off the road into the median and he tried to correct and ended up rolling the grocery truck,” Girard says. The supervisor says the driver was not injured and had to exit the truck’s cab by smashing out the front windshield. The highway was immediately closed down in the northbound direction while fluids were drained from the vehicle so it could be prepared to be righted. The first task though, was removing the full load of groceries. Coastline Towing Owner Tom Caflisch says, “When we’re unloading it, we ensure that anything that is damaged we put to the side so we consider that contaminated and that anything that’s unbroken and clean and in 100% good condition we’ll repalletize it." The highway is expected to remain closed until sometime Friday afternoon.